Novice monks gathering alms. 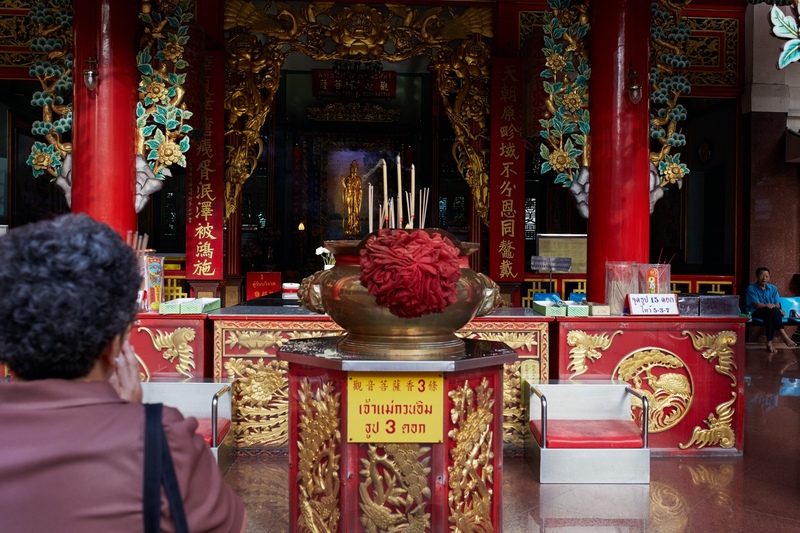 Chinatown, Bangkok. When I first arrived in Bangkok in 2013 it seemed so fascinating. I stepped out of the airplane and thought for a while about the insanity of people standing upside down on the other side of the planet. I had never been so far from home. Things were odd at a micro and a macro levels: different looking food, buildings, and transit. A different language with an unusual alphabet. 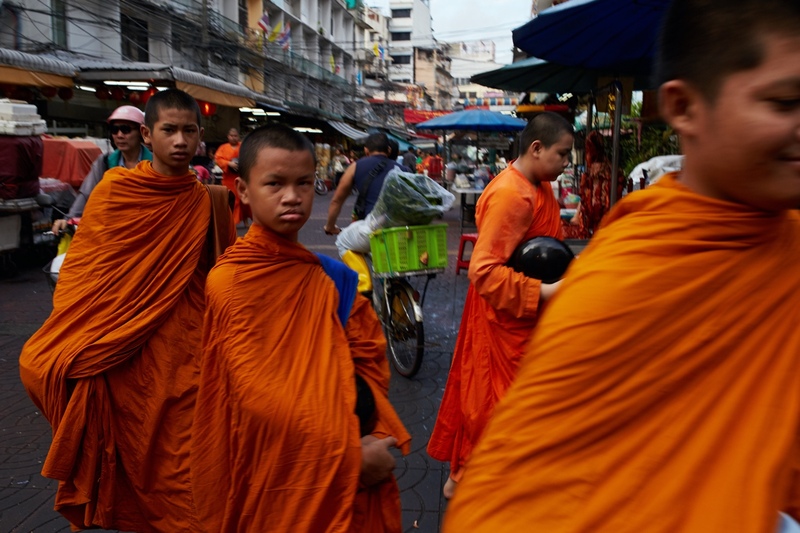 Monks walking everywhere in gorgeous orange robes. Now after many visits to the city and a lot of time exploring or visiting I actually have some difficulty photographing Bangkok because it feels so normal. That’s a strange mental place. 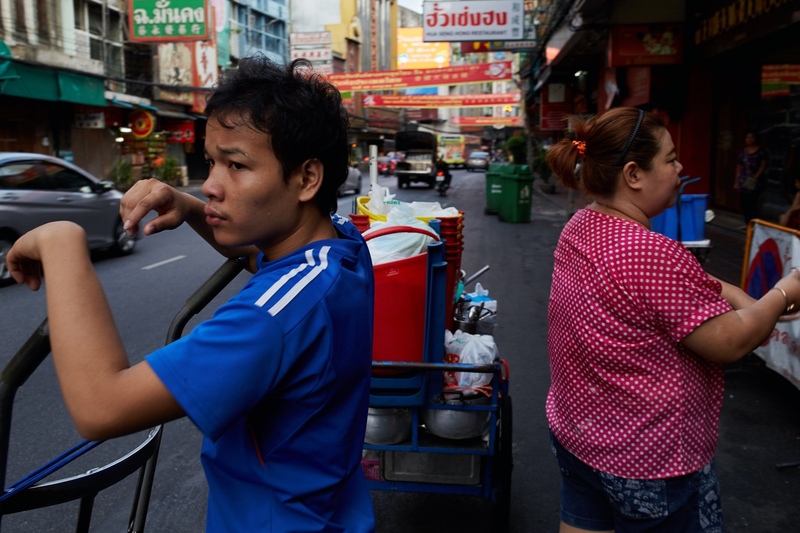 Compared to Cambodia, Bangkok feels a solid 50 years into the future. Cambodia has one big shopping mall. Bangkok has dozens. Cambodia has no metro. Bangkok has at least two, and perhaps four or five, depending on how you count. It feels like a major place. 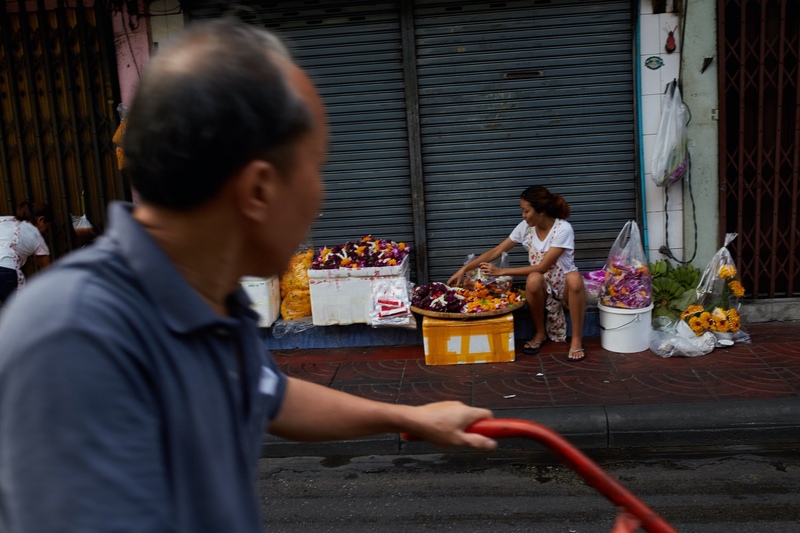 Like Cambodia, Bangkok’s Chinatown is hectic with a lot of action in the streets. Also like Cambodia this seems to peak at night — when everything is a bit too chaotic for me — and the mornings, when the air is cool, people are moving slowly, and I can see the city beginning its day. I find that things are more collective and beautiful in the morning than at night: praying at temples, monks gathering alms, women selling flowers, people unloading trucks or cooking or sweeping. It feels like a rebirth. Here are just a few photos after many days taking pictures. On one particular morning more things came together than had before. Woman selling flowers. Chinatown, Bangkok. Feet and yellow chairs. Chinatown, Bangkok.